Countless calls are received from homeowners who are selling their home and the intercom system in their home is not working, what can they do? Most believe their only option is to get rid of the system before settlement. Another cost-effective option is to upgrade the system. Several of the newer systems have more options and capabilities than ever resulting in some homeowners wishing they would have upgraded the system before they sold the home. If you remove the old system you will have to patch drywall in each room where there was a room station, possibly buy a new door chime if you current one is wired through intercom system, and paint the patched drywall which in all likelihood will lead you to paint the entire room. Many older intercom systems are becoming obsolete and have no parts available or are repairable. This means the entire system has to be replaced. The existing wire can be used 99% of the time. Drywall patching is rarely required. The new systems have Bluetooth capability, speakers that have much better sound than the old ones, doorbell function and look more modern. 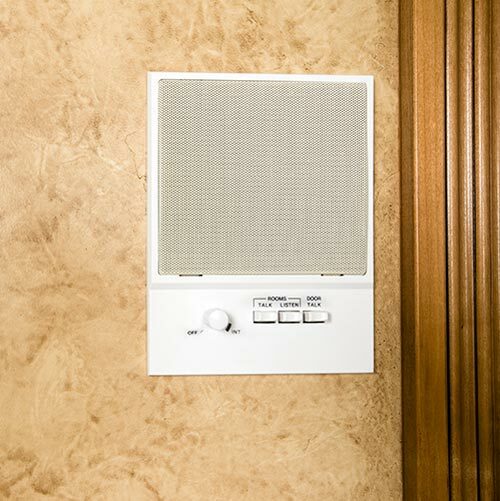 Even if the new homeowner does not want to use the system as an intercom they can use it as a music source. Each system has the option to connect ceiling or wall speakers, an outdoor patio station and the ability to listen to different music sources at the same time in different rooms. We offer complete turn key packages that make it easy to order a replacement system. If you would like more information or have questions, please contact our #friendlyexperts at 1-800-533-3249.